Pictures taken last week of the unsightly mess left by the receding waters of Alpha Lake. Mud, water and more mud threaten to engulf this worker at the bottom of the new sewer line. Casano Construction ran into difficulty last week when an old creek hidden underground was unleashed. The heavy equipment preparing the site for the Whistler Vale Condominium site. Approval for this 36-unit development was given on Monday night, July 31. Stella and Murray Coates’ party over the weekend produced a fine turnout of locals in the balmy weather. The largest ballroom in town! – the completed A building of the Town Centre parking structure. The group at the Sailer Fischer Ski Camp party catered by the Keg. (L to R) Wayne Wong, Wayne Booth, Schultz, Nancy Greene, Toni Sailer, Rookie, Alan White. Some of the headlines recently appearing in the Vancouver newspapers about Whistler. Gulf Oil truck pumps gas into the Husky tanks during the gas shortage due to Trimac dispute. Vicki Vogler and Laura McGuffin with the new Whistler hiking book they produced – now on sale at the Information Centre for 75 cents. Four excited kids take part in the 3-legged race at the Summer Recreation sports day. P. Hocking photo. Mountain Inn – as it’s been for two months. New construction should start soon. Blacktop was laid along the Blackcomb Mountain access road from top to bottom. Reports are that a skateboard contest may be held there. Pacific Blasting is currently at work carving out the rock in the Bayshores subdivision. Whoever buys this lot will have a magnificent view of the valley all year long. Alta Lake Beach is crowded with sun-seekers on Sunday, August 2. Don Wildfong, project manager of Pemberton airport, takes a moment off work to pose in front of sign that welcomes recreational fliers to Pemberton. The Ham/Murphy residence in Alpine Meadows that was damaged by fire on July 30. Axes fly at Squamish Logger Days. Sails flapping, windsurfers in the first heat of the men’s Triangle races skim away from the starting line during the BC Windsurfing Championships. Ms. Sue Christopher, the new teacher at Myrtle Philip School who will be teaching the primary grades, replacing Mrs. Alexia Turner. Ms. Christopher previously taught for 5 years at Signal Hill Elementary in Pemberton. Elisa Wilson, Anton Deduluc, Melanie Busdon and Samantha O’Keefe test out the new playground equipment at Myrtle Philip School. Built by Industrial Arts students at Howe Sound Secondary School with lumber donated by Garibaldi Building Supplies, this structure is just the first phase of the facilities. The Whistler Parent/Teacher Group has raised the funds which will raise the equipment. ON YOUR MARKS… GET SET… and the 90 participants in the Whistler Rotary Fun Run were off. Men and women, boys and girls of all ages took part in the race on a sunny August 2nd, Sunday. The Rotary Club hopes to make it an annual event. They’re off and running at the Rotary Fun Run which started at Myrtle Philip School Saturday, July 31. Runners registered for a 2.5km or 7.5km run around the Lost Lake area. Willie Whistler strikes up the band to celebrate their third-place ribbon received in the Squamish Logger’s Sports Parade held Sunday, August 1. These three answered the question of the week: Jenny Busdon, Housewife, Whistler Cay resident; Larry Gunn, Whistler Courier, Alpine Meadows resident; Dave Kirk, Alta Vista resident. They were swingin’ in the rain throughout the slow-pitch tourney, but Chris Streatham, with his dry sense of humour, came up with this catchy solution. Andrew Stoner, owner of Whistler Windsurfing, now has to take a definite step up in the world to jump the gap between his docks on Alta Lake. The two docks, one floating and one stationary, were at equal levels one month ago. Dave Phillips and Doug Hoy go through one of their routines during the Great West Ski Show in Village Square Saturday, July 31st. Phillips executes a somersault – one of many freestyle manoeuvres he displayed for appreciative audiences. A grader sets to work levelling roads in the Alpine Meadows subdivision, where paving operations will begin shortly. Steve Martin? No, this wild and crazy guy is parks worker Ted Pryce-Jones who was out last week painting arrows and yellow lines on Valley Trail curves and bends. The new lines and arrows are designed to give cyclists and pedestrians warning and keep users to one side. Swimmer Shelley Warne was one of 36 swimmers who participated in the Sixth Annual Molson’s Fun Swim on Alta Lake Sunday. Warne swam from Wayside Park to Alta Lake Inn and back under the watchful eye of Marilyn Moore, who dusted off her bathtub derby craft for the occasion. Fun swim organizers report the event went off without a hitch. Other competitors in the swim included Sharon Daly, Joan Parnell, Mike McCroden, Leslie Bruse, Molly Boyd, Shawn Hughes and Daryl Stone. Men’s and women’s winners were John Puddicombe and Shirley Fay, who completed the three-mile course in times of just over a half-hour. George Kelly of Seattle was the 10,000th golfer to tee off at the Whistler Golf Course this year. Kelly, a food service distributor, played his round July 24. Bookings on the course are at 100 per cent most weekends and 80 per cent weekdays. Numbers are up considerably from last year when the 10,000th player came through in the second week of September. The only problem the course is having now is that players are having a hard time getting tee times. Members from the Alta Lake Community Club officially opened one of its five benches last Wednesday that it recently donated to the municipality. The club donated $1000 and parks planner Tom Barratt used the money to build the benches located along the Valley Trail. Trudy Gruetzke cut the ribbon opening the benches with other ALCC members, Heather Gamache, Nancy Treiber, Louise Zinsli, Evelyn Cullen, Marg Fox and Suzanne Wilson. This week begins and ends with Myrtle Philip in the Myrtle Philip School gym, with quite a lot that happened in between. Myrtle Philip, the valley’s long-time resident, met Dana Parker-McLain, one of the valley’s newest, at the Community Club’s Potluck dinner. Logging truck and cargo lies strewn along the highway after sliding over 150 yards around a corner only 1/2 mile south of the Gondola area. Whistler Parlour Group… Beth Pipe, Diane Smith, Candy Rustad, Brenda Dunbar and Pat Beauregard. Heather Muir and Morag Marshall with ‘Safety Bear’ Hansen at the school. Big office… small desk! Blackcomb’s accountant Larry Osborne sits behind his temporary desk in a deserted Blackcomb trailer. Hello! Macauley Nicolls Maitland manager Debbie Teigen smiles as she finally gets her office phone after 5 months of waiting. New Fire Chief Wayne Schepull stands with the Whistler Volunteer Fire Department at their first meeting together on June 4. Looking down on the Village Square and some of the 70 motorcycles that were parked there on Sunday. Craig Tomlinson playing one of his hand-crafted dulcimers. This is the first motorist to miss the approach curve to the Culliton Creek Bailey bridge. The accident occurred on June 6. A semi-permanent abode graces the shores of Green Lake in a makeshift campground on private property. Bottles, remnants of campfires and dirty pans litter the ground in this otherwise beautiful setting. Weigh, hey, up she rises… Cranes hoist the 18-ton concrete spans into place over 19 Mile Creek June 1 in preparation for the new bridge. December ’81 floods washed out the old wooden bridge, severing Valley Drive in Alpine Meadows. Pause awhile in Whistler Village the next sunny day and you’ll hear this group of young musicians perform a wide variety of selections. (L-R) Jennifer Porter, Cal McConnell, Connie Carver, Dan Cushing, and Frank Mallany are a part of a federal government student employment program run by the WRA. In addition to displaying their musical talents these young people will be offering village tours, working at the new information booth and helping at special events. Ray Lyman, band director of Seaton Secondary School from Vernon, was pleased to present Whistler’s Molly Boyd with a band booster award for the services she rendered in bringing the group to Whistler. Band members and audiences alike braved cold winds to share a top-rated concert of big band sounds. Chips fly where they may as Jud Forster (left) and Stan Hammond prepare red cedar logs for a carport in Whistler Cay Heights being built by Hammond and Davies Log Builders. Mike Sweeney (seated) of Vancouver’s Whitecaps soccer team signs a few autographs at Myrtle Philip School sports banquet Thursday. Thirty-one students graduated from Pemberton Secondary Friday night, including Scott Logue of Whistler who received the Governor General’s Bronze Medal for academics from school Superintendent Trevor Harris. More than 500 people attended the commencement ceremonies at the Pemberton school, making it the second largest annual event in the town next to the Christmas concert at Signal Hill Elementary. Logue, also class valedictorian, was among three local students who received awards. Rob O’Keefe was awarded the Whistler Mountain Ski Corporation bursary, and the Alta Lake Community Club picked Rob Boyd as this year’s recipient of its bursary. Whistler’s branch of the North Shore Community Credit Union opened on Friday, just two months after it was approved. By 11 am Friday a line-up was formed, and on Saturday the credit union had 150 new members. Credit union President Susan Burdak (left) spoke to the crowd at Saturday’s official opening. Cecile Valleau is Whistler’s newest postmistress. She was promoted to the position May 22, taking over from Debbie Cliffe, who was transferred to the Agassiz post office. Valleau has worked at the Whistler post office since 1979 and is a 15-year valley resident. Skiing may be over for the year, but work on Whistler Mountain still continues. At the end of each season all the chairs, including those on Olive Chair, are taken off the cables, checked and then moved to a different spot to prevent metal stress. As well, the metal clamps holding the chair to the cable periodically undergo magnetic tests for cracks. The venerable Myrtle Philip drew the winning ticket Thursday in a draw for a Molson World Downhill poster signed by the Canadian downhill team. Assisted by Glen Rustad (right), Whistler’s grandmother chose Bill Carson’s ticket. Proceeds from the draw went to the Whistler Singers, which performed Thursday at the elementary school accompanied by the students. The show, which ended in a standing ovation for orchestrator Molly Boyd, featured musical performances by kids on recorder, guitar and ukulele. Winters at Alta Lake were a quiet season for the small community without the crowds of summer visitors. Whistler Mountain did not open for skiing until 1966 and until then downhill skiing in the valley was uncommon. Instead winter sports centred on and around Alta Lake. In addition to cross-country skiing, snowshoeing and sleigh rides, activities that took place on the frozen lake itself were popular within the small community. With the right conditions skating was a common pastime that could quickly become a community gathering with a bonfire and marshmallows. In 1924 Sewall Tapley built an iceboat for his daughter Myrtle after she injured her leg. He used a few boards, old skate blades and a sail and thus introduced a new activity to Alta Lake. With a good wind the iceboat could easily outpace the skaters. While the iceboat did have a tiller attached it was not an effective means of steering. Instead, Myrtle recalled, “we’d crash into the snow bank on the other side of the lake, get out and turn it around to get home.” In the 1980s a new generation tried sailing on Alta Lake, this time using “windskiers” which hopefully had much better steering capabilities. Wind skiing was a new sport for Alta Lake. Photo: Whistler Question Collection, January 1985. The lake continued to be a community gathering spot for Alta Lake residents through the 1950s and into the 60s. In the January 5, 1960 edition of the “Alta Lake Echo”, the weekly newsletter put out by the Alta Lake Community Club under various named from January 1958 until June 1961, it was noted that “a good crowd turned out Friday night to skate and spectate at Rainbow Rink. Cabin 8 was cosy and warm for the less hardy types and those whose feed would not fit the available skates.” The evening ended with hot dogs and hot chocolate provided by Alex and Audrey Greenwood, then owners of Rainbow Lodge. The same newsletter also reported on the annual New Year’s hockey game that was postponed “due to poor player condition after New Years Eve. Rescheduled for 2 pm Jan. 2nd, game commenced promptly at 3:30.” On the side of the Alta Lake Amatoors were Frantic Fairhurst (foreward front and centre) and Non Stop Crankshaft, Capricious Croaker, Gummed Up Gow and Fearless Ferguson (all playing defence). The Rainbow Rockets lineup featured Sky Scraper Skip (“centre, right and left, fore and back”), Spud Murphy (“goal defence and generally against Alta Lake making a goal”), Gallopping Greenwood, and GoGetter Gordon. A game of hockey on frozen 19 Mile Creek, November 1978. Photo: Whistler Question Collection. Despite having fewer players, Rainbow took an early lead that they kept for a final score of 7-1, though the accuracy of the score is questionable. According to the sports report, “before the first half of the first quarter was over the judges retired to the warmth of Cabin 8 and the score was rather hard to keep track of.” Clearly the residents treated this game with the utmost professionalism. The opening of Whistler Mountain shifted the focus of winter sports away from Alta Lake, though it took only one winter with very little snow to return people to the lakes. According to the Whistler Question, in January 1977 Whistler Mountain closed due to “adverse weather conditions”. Instead skating, hockey and even ice stock sliding kept the community busy. Ice stock sliding, a sport introduced to Alta Lake during a particularly bad snow year, remained popular in Whistler for some time. 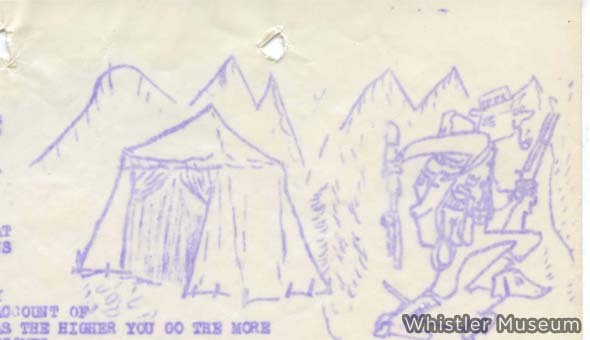 Photo: Whistler Question Collection, January 1980. Today, if the lakes have a safe layer of ice, ice skating and hockey games can still be seen on lakes throughout the valley. For some people the long, dark and cold nights of winter are reason to stay warm indoors and catch up on episodes of something on television or watch movies in the comfort of your own home. Though now a common way to spend an evening, television did not arrive in Whistler – then Alta Lake – until the 1960s and movie nights in Alta Lake began as community events. The original Alta Lake schoolhouse also served as the valley’s first community movie theatre (among other purposes). Denis and Pat Beauregard, who ran movie nights as ALCC volunteers, receiving silver coins for Whistler Mountain’s 25th Anniversary from Maurice Young (centre). Pat and Denis Beauregard ran the movie nights for eight years as volunteers in the 1960s and 70s, first in the community hall and then later in the cafeteria at the base of Whistler Mountain using a portable screen donated by Myrtle Philip. For those who missed a show due to impassable roads, the Beauregards would provide an extra showing in their home. The building of the Rainbow Theatre during the construction of the Village in the 1980s marked Whistler’s first commercial theatre. Due to having only one screen and limited show times, however, movies continued in many ways to be community events (without the howling dogs), especially during the slower spring and fall seasons. Today visitors and residents of Whistler have many options when deciding what to watch; Village 8 Cinemas opened in December 2002 with multiple showings of various films daily, the Whistler Public Library has a large collection of movies that can be borrowed for free and streaming services such as Netflix provide access to films without the need for walking through the snow at all. As the end of summer approaches many people might make the most of it by going on one last camping trip before heading back to work and school. To all those, the Museum would like to offer the advice of Old Bill, suitable for all seasons. Waiting for the train at Alta Lake station, 1937. Left to right: Bill Bailiff, Mr and Mrs Racey, Ed Droll, Betty Woollard, Larry, Flo and Bob Williamson. Born in Liverpool, Bill Bailiff moved to Canada and began working for the Pacific Great Eastern railway in 1913. He soon quit over unsafe working conditions and walked up the unfinished track to make his home at Alta Lake. 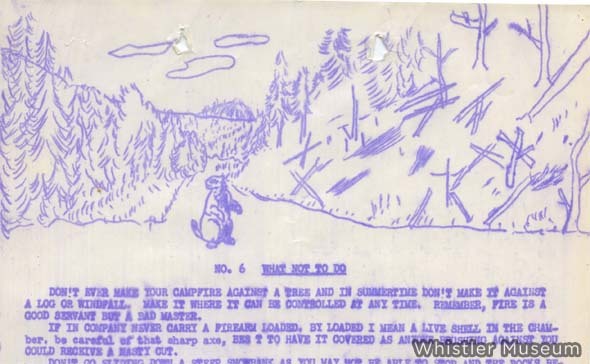 Bill settled in a log cabin on the Pemberton Trail near Scotia Creek and kept a trapline up the Cheakamus and in Fitzsimmons Pass. 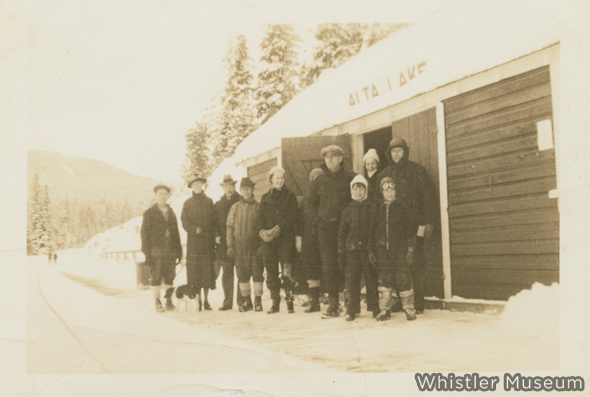 As the community around Alta Lake grew Bill became an involved resident so that at the time of his death in 1958 he had been serving as the president of the Alta Lake Community Club. First Alta Lake Community Club picnic on the point at Rainbow. 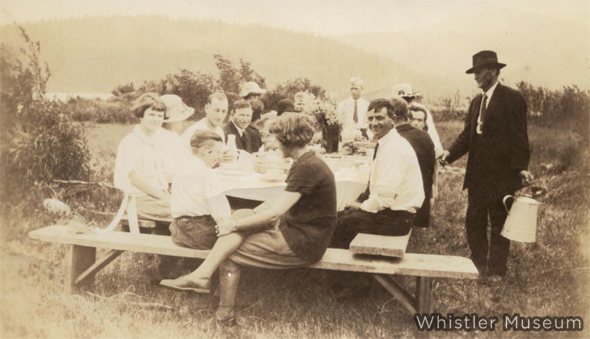 Founded in 1924 the Alta Lake Community Club regularly held dances, card parties, and film nights, as well as constructing the first school building in the area. The club also put out a weekly newsletter called the Community Weekly Sunset to which Bill, as president, contributed a column on life in the mountains. Going through the archives I found one of these columns entitled “What Not to Do” and thought it was time to share the advice of Old Bill. Original illustration from the Community Weekly Sunset. 1. Don’t ever make your campfire against a tree and in summertime don’t make it against a log or windfall. make it where it can be controlled at any time. Remember, fire is a good servant but a bad master. 2. If in company never carry a firearm loaded. By loaded I mean a live shell in the chamber. Be careful of that sharp axe, best to have it covered as anyone brushing against you could receive a nasty cut. 3. Don’t go sliding down a steep snowbank as you may not be able to stop and the rocks below are harder and sharper than your bones. 4. If on a glacier don’t ever attempt to cross on a snowbridge over a crevice as these are liable to give way anytime so leave that to the experienced mountaineers who rope themselves. 5. Don’t be a litterbug around a campsite clean it up as someone else might be along to use it and don’t stay too long on a snowfield without dark glasses on as you may get a terrific headache from partial snowblindness. 6. Remember your forest ranger is your friend and you’ll find him very nice and co-operative providing you are not a careless firebug who none of us has any use for. 7. Don’t go killing wild life needlessly as some species are nearing extinction from indiscriminate slaughter. Much better to try a shot with your camera and picture them. 9. Don’t be an old grouch round the camp or on the trail as this has a bad morale effect on others. If the going is tough take it with a smile and joke about it as it makes it easier and pleasanter. From a different issue but still applicable. Original illustration in the Community Weekly Sunset. Sound advice, 90 years ago or today. Happy camping!